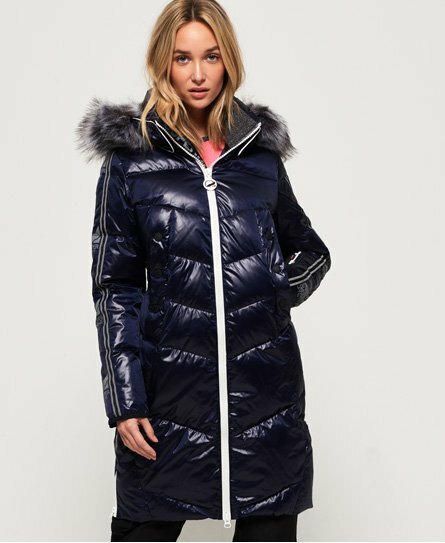 Superdry women's SD Glacier Isobar Down jacket. Stay warm in the snow with the SD Glacier Isobar Down jacket, featuring a removable hood with detachable faux fur trim, double layer collar for extra warmth and a 90/10 premium duck down filling for fantastic insulation. On the outside, the jacket features two zip and popper fastened pockets and a ski pass holder on the sleeve for practicality. Inside, the jacket features a zip fastened pocket, while wrist gaiters help keep the warmth in. Finishing touches include zip detailing on the hem and cuffs, reflective stripe detailing down the sleeves and a Superdry logo badge on one arm.